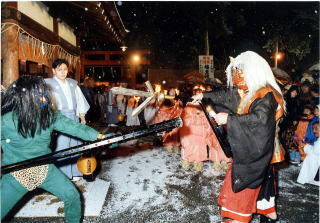 There are also rituals that literally exsorcise Oni. 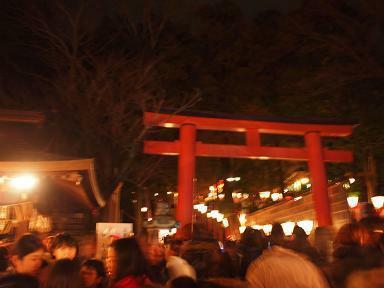 To get to Yoshida Shrine, take Bus #17 from Kyoto Shiyakusho mae and get off Kyodai-Nougakubu-mae stop. We will hold event of Rakugo in English, coming April. We will have rakugo performer Sayohime, she will demonstrate what is Rakugo and have workshop after her performance. Rakugo is a 400 year-old form of comedic Japanese storytelling that is still popular today. The story teller kneels on a Japanese cushion to tell a funny story written in dialogue format and uses two props ; a fan and Japanese cotton towel which can become many things such as wallets, or chopsticks. It had become the custom to include a “punch line” at the end of the story for added effect. When I was student. I devoted myself to performing musicals. I have performed Rakugo in English not only in Japanese but also in forein countries. (NY in 200t NZ in 2006 SF in 2007)since 2002. I want to perform in smaller spaces where I can have a closer connection with my audience. I look forward to sharing the joy of Rakugo with you! We wish this year will be the wonderful year for all.